Visit the Smokies this Spring! - Follow Me to Tennessee! Inquire now! Candlewood Cottage is a lovingly designed decorated log home where 'rustic meets romantic.' Relax in the open concept upper level featuring a king-sized log canopy bed with a pillow top quilted mattress, vaulted ceiling, etched and stained glass windows, a fully equipped kitchen with a dishwasher and microwave, a charming living area with gas fireplace, tasteful regional artwork, log furniture, HD TV with DVD, stereo system, a full bath and a closet with cedar shake roof. Step out thru the atrium door to the upper deck and enjoy the large hot tub, gas grill, plants and birdhouses where woods and the National Park serve as your back yard ensuring privacy and peaceful moments. Carpeted stairs lead you to the lower level featuring a queen sized log bed with pillow top mattress, log furniture, a glowing electric stove, jacuzzi tub, washer and dryer, TV with DVD, another full bath and full-length deck with rustic furniture. Candlewood Cottage is conveniently located just 25 yards from the club house and pool. It offers privacy without being remote, personality in its decor, and all of the candlelight, firelight, sunlight and moonlight you might desire. The attentive owners share your appreciation for the beauty and wonder of the Smoky Mountains....Feel at 'home'....Relax, simplify, and make a memory soon. Approx 3 miles from downtown Gatlinburg. Located in Mountain Shadows Resort area. Community pool is just across the street. Really enjoyed our time at your cabin. The location is great and so is the cabin. My wife and I came up for her Birthday without the kids! We have had a very rough month prior to our trip due to our 7 year old daughter being hospitalized for 15 days due to a very rare kidney disease. We have been stressed to the max and needed a weekend to unwind and recharge. This place was just what we needed. The only 2 small complaints I have are that one of the jets in the hot tub wasn't working. Not a big deal by any means. Also, the door going out on the back porch to the hot tub is very hard to open. You really have to pull it hard due to it sticking at the top. It's rather loud and it makes it tricky getting out there with someone sleeping in the bed without waking them up. Again, not a huge deal. We would definitely stay there again! Thanks! 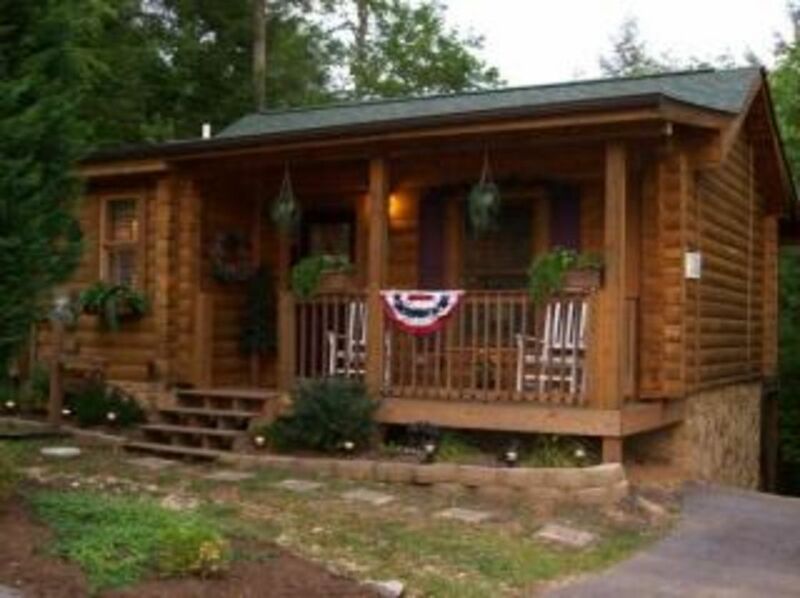 Beautiful well maintained cabin very close to everything. My wife and I were looking for a couple of day get away while on our way to visit relatives in Tennessee. We couldn't have asked for more. Quiet relaxing location in the mountains. Cabin was clean, well appointed and charming. We'll be coming back next time we are in the area. The cabin is really cozy, warm and cute. Also, it is clean inside. We enjoy every minute of our stay. I will definitely come back again in the future! We so enjoyed our stay! The cabin was much bigger than I thought! Very Clean and very welcoming! Very close to Gatlinburg! Will be back! There were a few problems, but nothing to ruin our stay. Nightly Rate: $119 - $129 Weekly Rate: $714 - $774 Monthly Rate: $714 - $774 Winter rates thru March 15 - $119.00 per night. After March 15th, $129.00 per night thru September 10. Ask about multi-night or weekly specials! Spring and summer months fill up fast - don't delay making your plans! Sept 11 - Sept 30 - $119.00 per night - October 2014 $129.00 per night.